"It may be hard for you to see right now, but God has a plan for you. Scripture promises He takes everything and makes it work for your good. You can count on Him." (p.290) Mended Hearts These words were penned by Kelly Irvin but they could apply to all of the stories found in An Amish Reunion. This new book is a collection of four novellas that focus on relationships that appear to be damaged beyond repair. The characters are of varioius ages and the circumstances are all different but each story allows us to see these Amish people during their weakest moments. Their True Home promises us that we can go home again; A Reunion of Hearts shows us that our greatest hurts and our deepest sorrows can be healed; A Chance to Remember suggests that love and companionship is possible during our golden years; and Mended Hearts teaches us that love and forgiveness is often the cure for our deepest hurts. Each of these stories offers the assurance that nothing is impossible! Amy Clipston, Beth Wiseman, Kathleen Fuller and Kelly Irvin are all talented authors in their own right but their combined talents have produced an enjoyable collection. 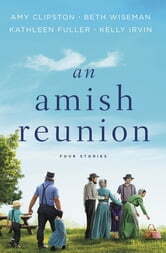 I recommend An Amish Reunion for anyone who likes Amish stories and Christian fiction. I received a complimentary copy of this book and I voluntarily chose to share this review. My opinion is this is the best Amish Novella Collection I have read. What a great list of authors that should have you running to buy. This is an A-list collaboration. Amy Clipston starts us off with Their True Home. Who says you can’t go home again after 10 years. This story captures your heart and you will admire Marlene’s strength. Beth Wiseman will draw you into A Reunion Of Hearts. You will definitely need tissues for this amazing read by a must read author. You will be transported into the story of Ruth and Gideon as they walk the road of grief. Facing the difficult things helps us to grow and find healing. This is a must read. Kathleen Fuller pens A Chance To Remember and has me in my happy place reading about one of my favorite characters, Cevilla Schlabach. What a wonderful twist having an English man from her past visit. This is a rewarding read. Happy dancing. Mended Hearts by Kelly Irvin shows how finding forgiveness and acceptance after poor choices can be a long road, but repentance and redemption eventually comes if we have the perseverance to endure. Each story is a stand-alone but they share the theme of a reunion of some sort. You will be enthralled with this one. I received a complimentary copy from the author/publisher. The honest review and opinions are my own and were not required. An Amish Reunion contains four heartwarming and appealing stories. I found them to be well-written with steady pacing. All four stories contain relatable characters and situations. They deal with grief, heartbreak, self-doubt, loss of faith, and trust issues. Grief affects each one of us differently. As one of the characters said in Reunion of the Hearts “people say all kinds of things when they are grieving”. People say things they do not mean and later regret. We get to see how it affected our characters and changed their lives. I enjoyed getting the stories on characters I have come to know and love from these authors series. Cevilla is known for playing matchmaker and now the tables are turned. Hannah was shunned for her disobedience, but while she has been forgiven, no one has forgotten. I have wanted to know what happened to Hannah after her shunning (and now I do). One of the phrases I appreciated from this novella was “it is never too late to right a wrong”. The Christian elements are woven throughout each story. We see the importance of faith and prayer in one’s life. Amy Clipston’s Their True Home was an engaging story. I am drawn in immediately, read too quickly and am sorry when the story ends (best kind of books). My favorite story was A Chance to Remember featuring Cevilla. It was such a sweet story that reminds us it is never too late to reconnect with a friend or to find love. My favorite phrase from that story is from Cevilla “I always put my trust in God and always will”. One expression that is especially meaningful is “love is a home where your heart can live forever”. There are discussion questions after each novella. I delighted in reading these four heartfelt and impactful Amish novellas.